The Provenierswijk is a rather small but cosy neighbourhood located just in between Blijdorp and the Centre. As mentioned in the Stationsingel article (check the Spoorsingel article) it’s a neighbourhood with an authentic look and feel. Close to the Central Station you can find the most interesting corner of the neighbourhood. Caffe Booon is located on one side of the corner, Le Nord on the other. 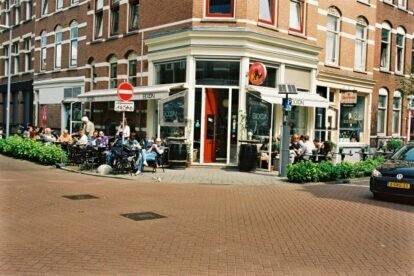 At the intersection of the Proveniersstraat and the Molenwaterweg you can find a nice spot on each corner of the street. One of those spots is Caffe Booon. A small coffee corner with a lot more than just a good cup of caffeine. Next to the traditional cups of single, double, latte or the like, you can go to Booon for Italian wine, a few liquors and when hungry also for a tasty sandwich. So whether you would like to wake up in the morning or get things started in the afternoon, Booon is the right spot to go to. Get yourself a newspaper and a cappuccino, find a seat inside or on the terrace. Once it’s time for dinner just cross the street and grab a bite at Le Nord or La Cazuela. If your busy schedules allows you some free time you can also contact Booon to participate in a barista workshop. The perfect way to get to know the basic coffee making skills.